As Game 6 of the 1991 National League Championship went on, the Braves' Ron Gant was confident the Braves would win, if only they could score. After all, young Steve Avery was on the mound. "We felt we would score, sometime," Gant told The Associated Press later. "There was a lot of tension on the bench. Things were not going our way. But we felt, with Steve pitching, one run would be enough." Gant's confidence stemmed from Avery's previous performance in the NLCS, where Avery went 8.1 innings against the Pirates for a 1-0 victory. It was a performance Avery repeated in Game 6. The performances together earned Avery the series MVP. Avery got to that point just three years after his career began. It began in 1988, taken by the Braves in the first round out of Kennedy High School in Taylor, Mich.
Avery made AA Greenville in 1989, then AAA Richmond in 1990. Avery also made Atlanta in 1990, debuting June 13. In 20 starts for the Braves, Avery posted a record that was almost the opposite of what he posted a year later. He went 3-11, with a 5.64 ERA. One of his wins, though, came in late August, against the Cubs. It was a complete-game gem, giving up six hits and no runs. "I was throwing the ball where I wanted pretty much every time," Avery told The Chicago Tribune after that game. "I'm just glad to finally do something up here." He did much more in 1991. In all, that year, Avery went 18-8, with a 3.38 ERA, coming in sixth in Cy Young voting. In the playoffs, Avery gave up only five runs in four starts, with the Braves winning three of them. The only loss came in Game 6 of the World Series, where Avery gave up three runs to the Twins. 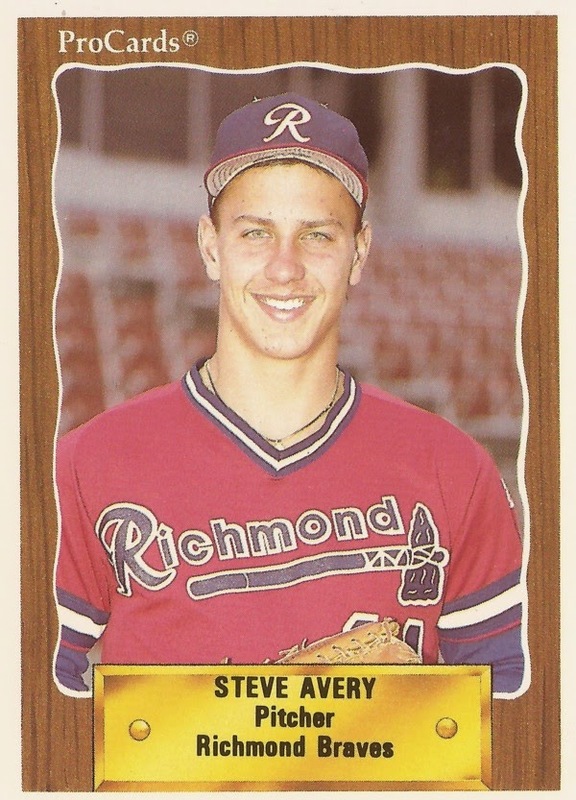 Avery stayed with the Braves through 1996, going 11-11 in 1992 and 18-6 in 1993. He also made the All Star team in 1993, posting a 2.94 ERA on the year. But, starting in 1994, Avery's ERA went north of 4 and, through 1996, he never won more than eight games. His 1995 performance resulted in a 7-13 record and a 4.67 ERA. He was also dropped from the Braves' post-season rotation, though he did pick up a start in Game 4 of the NLCS. In that game, against the Reds, Avery went six innings, giving up no runs. "I just wanted to feel a part of the success that our pitchers have had," Avery told The AP after that game. "I also wanted to prove to myself that everything was fine." Avery also got the start in place of Greg Maddux in Game 4 of the World Series against the Indians. Avery went six innings, giving up one earned run for the win. "I didn't fret a bit," Braves manager Bobby Cox told The Milwaukee Journal Sentinel of his decision to start Avery. "I have all the confidence in the world to start Steve Avery. 'Ave' left the game with a three-hitter. He's a gutsy guy." In 1996, though, he picked up the Game 4 loss, walking home the go-ahead run to the Yankees in the 10th inning. For 1997, Avery signed with the Red Sox. He also continued his slide. He went 6-7, with a 6.42 ERA. By September, though, poor performances, and a contract clause, conspired to see Avery pulled from the rotation. Avery pitched two more seasons in the majors, one with the Red Sox and one with the Reds. Shoulder problems, though, eventually prompted him to retire in 2001. Then, in 2003, he mounted a comeback attempt. He then made it back to the majors for 19 relief appearances with the Tigers. He also picked up two wins, his first coming with a single strikeout. "He's put in a lot of work and he was rewarded with a win," Tigers manager Alan Trammell told The AP after that game. "He's earned his way back."